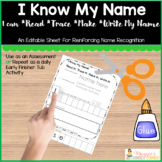 It has been a long time since I made my first tracing editable or posted about names, so here’s why I think names are so crucial to proper beginnings in school. 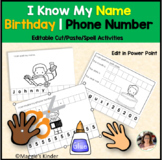 All kinder teachers know it is important to begin with names, and we all know our students have more likely interacted with tech devices rather than crayons and scissors. That is something that has changed in just the past five years people! Gone are the days when kids entering k have experienced creating art the “old-fashioned way”, or writing their names with a variety of writing tools. We have an amazing opportunity with a very short window of time to mold children into confident readers and writers. It is imperative we begin where they are, their world with their names as the door to all learning. I mentioned art and its place in working with names and fine motor. Kids are not ready to grip a small pencil or crayon unless the muscles are ready. This is my “excuse” (thankfully) for using art activities to promote enthusiasm and joy about learning. One things every classroom needs is play dough. Children work so hard to roll and form shapes when they work with this media. There is no better way to work those hand and finger muscles to prepare them for the tedious movement needed to write letters. However, they also do not come in with the ability to roll play-doh ropes or make the doh stick together in a ball. These are things they must observe, so be prepared to roll and model how it’s done. If you are not equipped with a commercial dough, here is a great recipe for the homemade kind. It has salt, and salt will help it last longer than recipes without it. As students get acquainted with manipulating dough,we should also encourage drawing with finger paint, then move on to triangular crayons. At each step we model how to form a letter with our fingers, making sure direction is talked about and corrections are made. I like to guide their hand at the beginning because they can learn how it feels to form the letter properly. You have to remember constantly that they may not understand what it should feel like: if it moves and stops abruptly as in forming a line, flows and meets again as in a circle. Because kindergartners make so much progress by May or June, it is easy to forget just how basic the instruction is at the beginning of the year. The same care and correction has to be given with holding a crayon or pencil. Here is just one of many ideas for painting names! As students devolop strength in working with different media, we gradually introduce the shape of their name and the letter names that make it. Again, they have to feel a connection. This is how it feels to write “my” name. Their brains are literally developing connections with the hands in order to have a more automatic memory of writing their name. Being diligent with making corrections along the way will help enormously with handwriting as the year moves on. Writing the name is so important, but giving meaning to why we write our names a certain way is critical. We need to let them know this new kind of memory they are working on (in forming letters) is going to help them be better at math and reading as they grow. I am always showing my students in my own writing how much faster I can write because I practiced the correct letter formation at their age. Never forget we are the most important model for them. What does my beginning of the year name work look like? Students complete a series of quick activities after breakfast each morning. This year I have switched from large binders to a half sheet size kit with 5 steps. 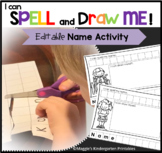 An alternate spelling activity is also in the kit for choice in doing the spelling step. Check out this video for information on this kit. I try to get an A+ tutor in my classroom during our reading block each year to help monitor who is forming letters correctly, or who needs more practice in recognizing letters and sequence that spells their name. I have students to work on name writing with a dotted font practice sheet 3x a week until they are fluent in writing their first and last names. This is part of their center work on Monday, Wednesday and Friday. If you have a long reading block, there is plenty of time to do centers, then signal name work for the last 20 in of the block. Here are other name activities from my TpT store. The “I Can Spell My Name” cut and paste activity is my top seller. Need a quick online form for name practice? This is what use to help students learn directional writing. It really helps! And here is another freebie for you! This is the puzzle set I will be using with the Portable Name Toolkits this year. How do you introduce names? What do you do that makes learning to write names more fun Share!! !